I am completely and utterly in love with Sicily! 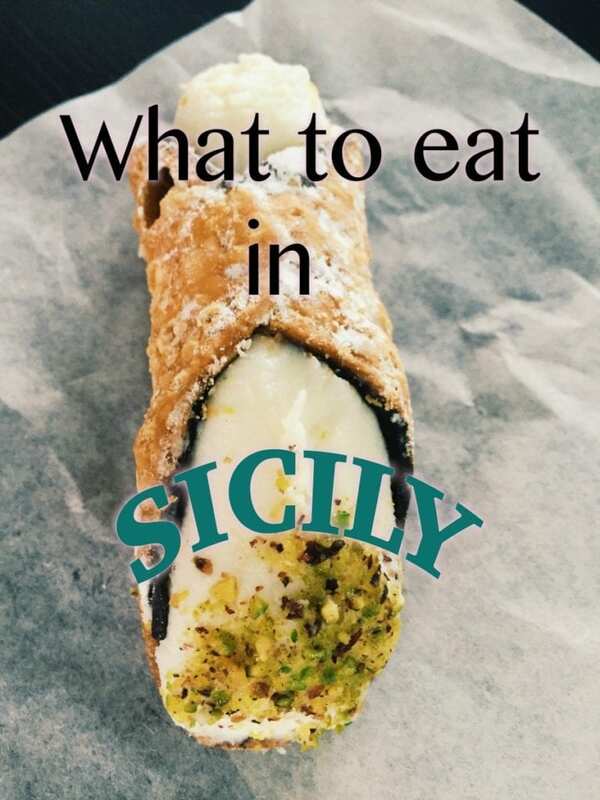 When I think of what to eat in Sicily, the list could get very long. The history of Sicily is complicated and totally unique. Sicily is Mediterranean through and through. This beautiful island was invaded for 25 centuries by the Greeks, Romans, Phoenicians, Arabs, North Africans, Byzantines, Goths, Spaniards, Persians, Bourbons. All of these different people left their mark on Sicily’s archeology and most notably, in its cuisine. 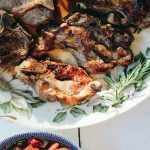 Sicily’s cuisine is different than any other region of Italy. You will find dishes made with cinnamon, saffron, raisins and the Arab influence of sweet and sour. All of the different invasions left an impact on this beautiful island and especially left a mark on the incredible cuisine. Since Sicily is surrounded by water, you can expect to find superb seafood. But if you aren’t there for the seafood and prefer something different, there are other wonderful things to try. My father’s entire family is in Sicily. I lived in Sicily as a young girl and spent countless summers there with my family and friends. 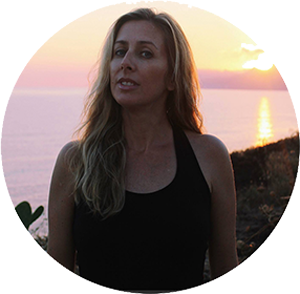 Sicily is a place that is so special to me and I get goosebumps when we arrive at the the airport in Catania. 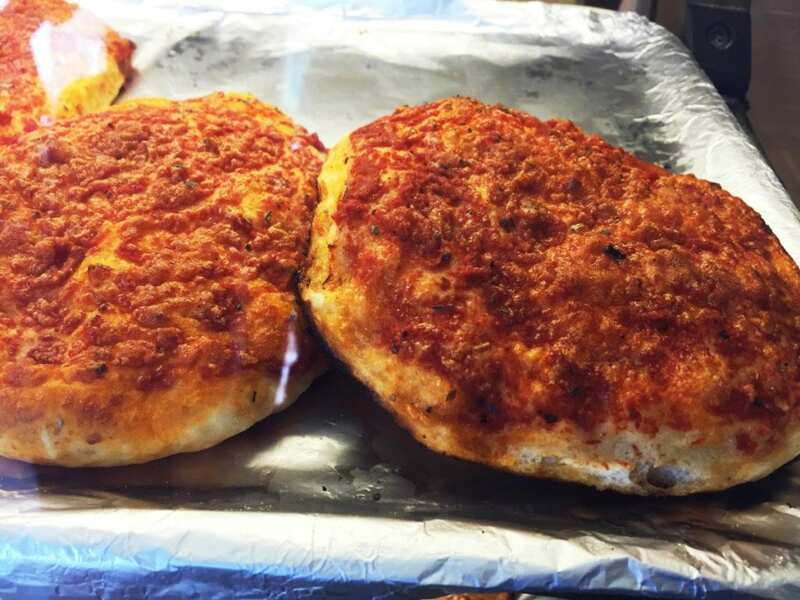 I’m blessed to have the opportunity to take my children there and show them their family history and introduce them to the food of a very different part of Italy. This is just a little sample of what we ate last month in Sicily. 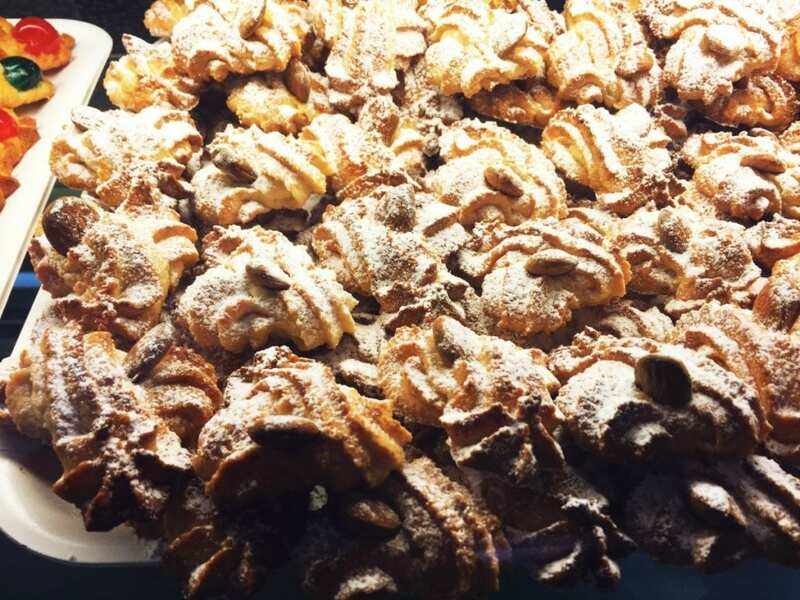 Whether your desire is sweet or savory, Sicily will have you completely smitten at first bite! Cannoli Is it wrong for me to say that the first thing I want to do when I get back to Sicily is buy a cannolo? Let me explain something really quickly about the name: cannoli means more than one cannolo. When you ask for cannoli, they will think you are buying more than one, which most likely, you will be!!! I have never had a bad cannolo in my dad’s hometown. The shell is always super crispy and it crumbles everywhere when you take that first ravenous bite. The ricotta is usually made from sheep’s milk and has such a sweet and distinctive taste. 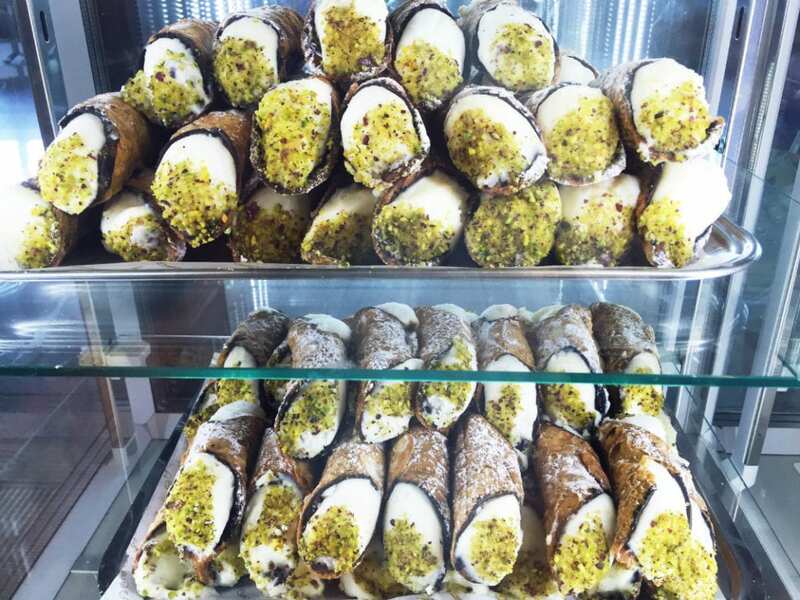 In the summertime, you probably won’t see any cannoli out in the display. Just ask for some and they will fill it fresh when you order. If it’s sitting there with the filling for a while, it will be soggy. You could also order yours with pastry cream. Either way, you can’t go wrong and it will be like nothing you ever had before. Trust me! Pizza On this most recent trip to Sicily, we had the chance to visit a fairly new and pretty famous pizzeria called Sarda Salata. I took a few more photos inside of the pizzeria and I wanted to explore the pizzaiola’s history a bit. My cousin explained he won an award for best pizzaiolo. I wasn’t sure what to expect, because it was my first time eating pizza at an actual pizzeria, and I am happy to say it was outstanding. The street food pizza is totally than what you will get in a pizzeria. 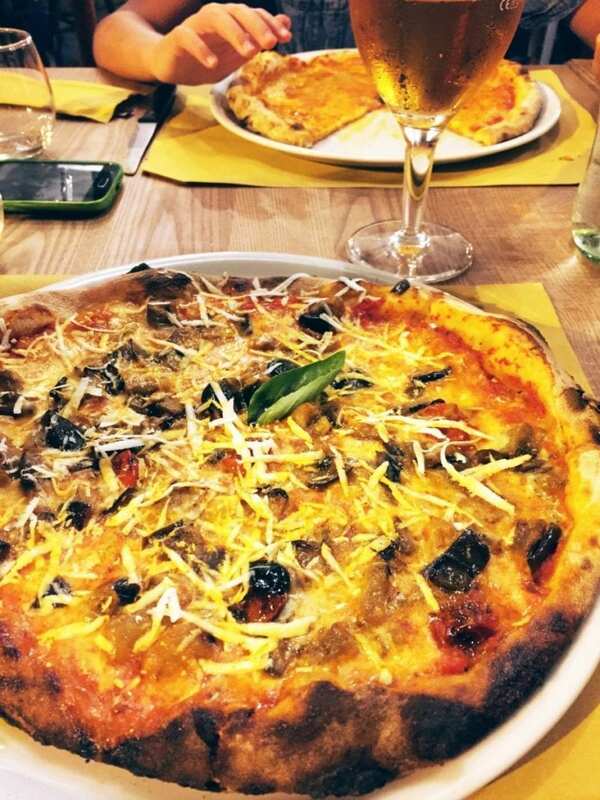 If you are walking around Sicily and want a quick bite while you’re exploring the amazing sites, don’t hesitate to try a pizza. They’re usually round and small and the dough is thick and soft. These were the pizzas we tried one very hot afternoon when we also were enjoying the arancini. The pizza was very cheap and it was very good! 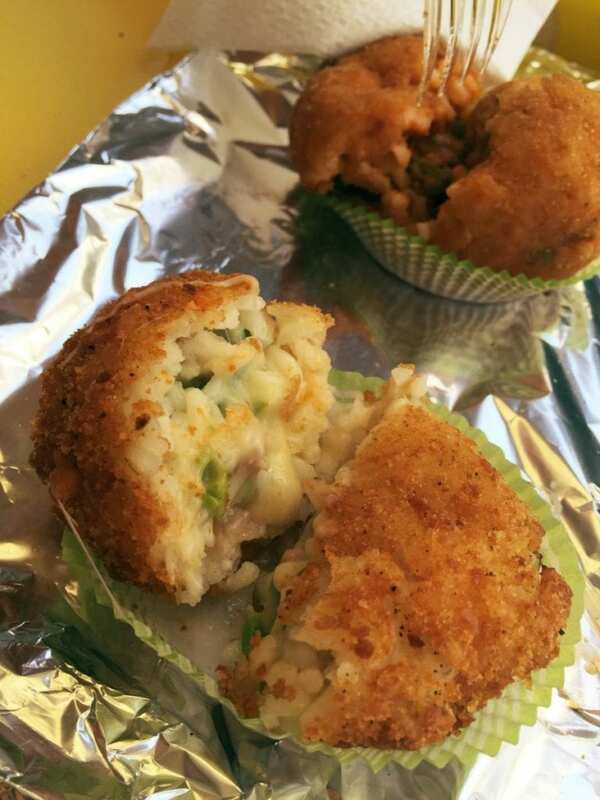 If you have a small budget for lunch, street food is the way to go while in Sicily!! Arancini (or Arancine) are fabulous balls of rice. The rice is mixed with cheese and meat. The whole round shaped delight is breaded and fried and is the shape of an orange (arancia) and that is where the name comes from. You may find arancini that are even cone shaped, but in my dad’s town, they are round. The pizza spot we passed by had two varieties: the white one that had ham, cheese and peas and the sauce version that is filled with a tomato meat sauce. 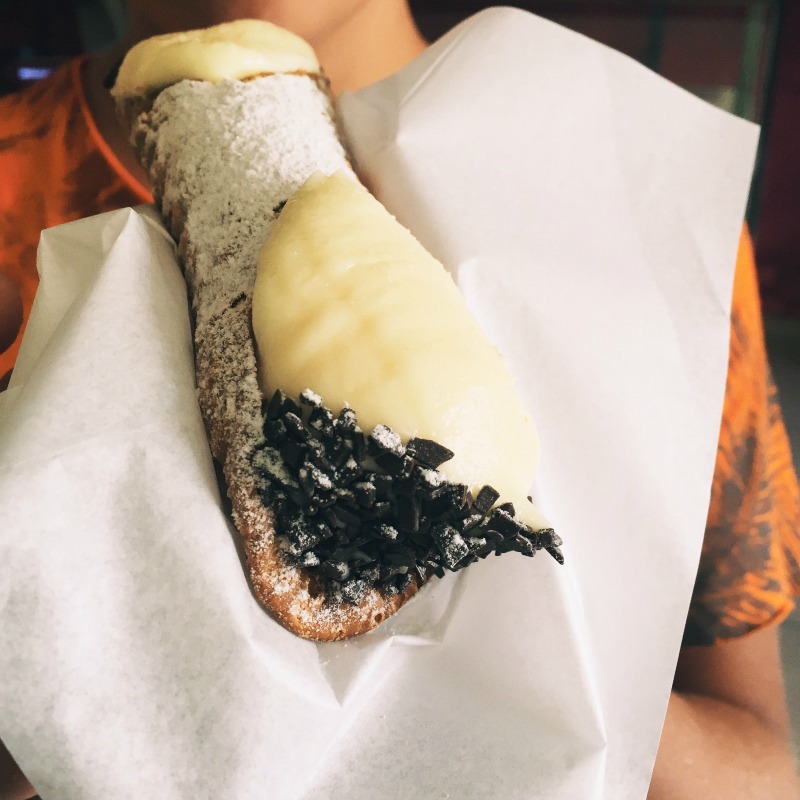 They are the ultimate Sicilian street food! Arancini are economical and really great! But like any thing, depends where you get yours. We stopped by a place that is owned by my cousin Giuseppe’s in-law, so he knew the arancini and pizza would be good. Ask around at your hotel for a great spot to grab your arancini! 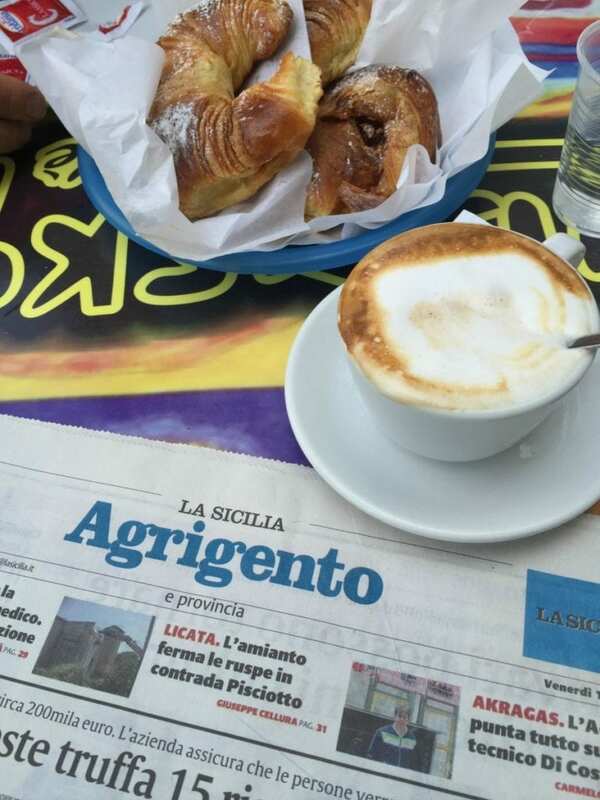 Brioche and Cappuccino for Breakfast Sicily isn’t known only for its famous cannoli and outstanding cookies. You must also check out their brioche (or croissants)for breakfast, or even after breakfast. Sometimes later in the morning you will happen upon a bar and you may find some leftover from breakfast. 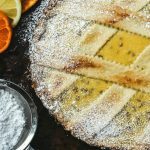 This summer in Sicily we tried some made with marmalade and even pistachio pastry cream (OUT OF THIS WORLD). Seriously, pistachio pastry cream inside of a flaky brioche is what Sicilian breakfast dreams are made of. 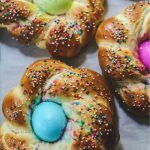 In Sicily, you can also find your brioche filled with fresh ricotta (crazy good…CRAZY good). I know, these food memories get me a little happy. And a quick reminder on cappuccino while in Italy: You should only have one for breakfast. Really, they will look at you like you’re not doing the right thing if you order one after lunch or dinner. Biscotti Sicilian cookies are out of this world. Some are very simple, like the ones photographed below, and some are more ornate and many of them are made with almost paste (2nd photo below). 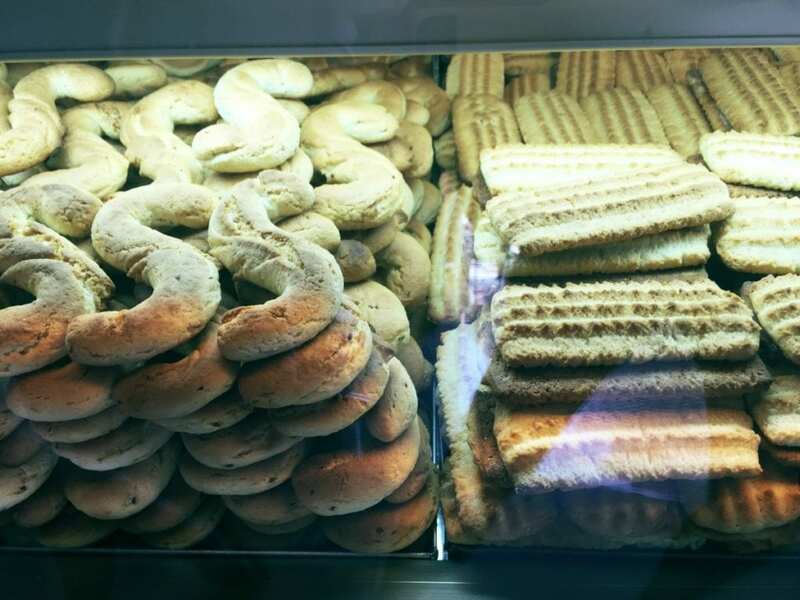 The cookies on the left are the famous S cookies that are made with fennel seeds. The ones on the right are simple cookies without any notable flavor that are perfect to dip in your cappuccino or caffe latte for breakfast. The almond cookies are light and amazing. Sicily grows the most incredible almonds. 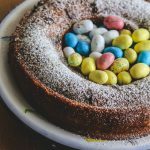 The cookies are chewy and so very soft made with almond paste. Granita in Sicily will be different than granita you will find in other regions of Italy. Sicilian granita isn’t runny and you can’t drink it with a straw. The granita is thicker and very smooth. You can find different flavors depending what bar you visit. At one place in my dad’s hometown, they were serving almond, lemon and strawberry flavors. At another little gelato place that is pretty popular, the owner had just lemon and served it in little plastic cups. You could have your granita in a cup or in a big and fluffy brioche. When I was a little girl spending summers in Sicily and when I lived there, that was pretty much my summer breakfast! 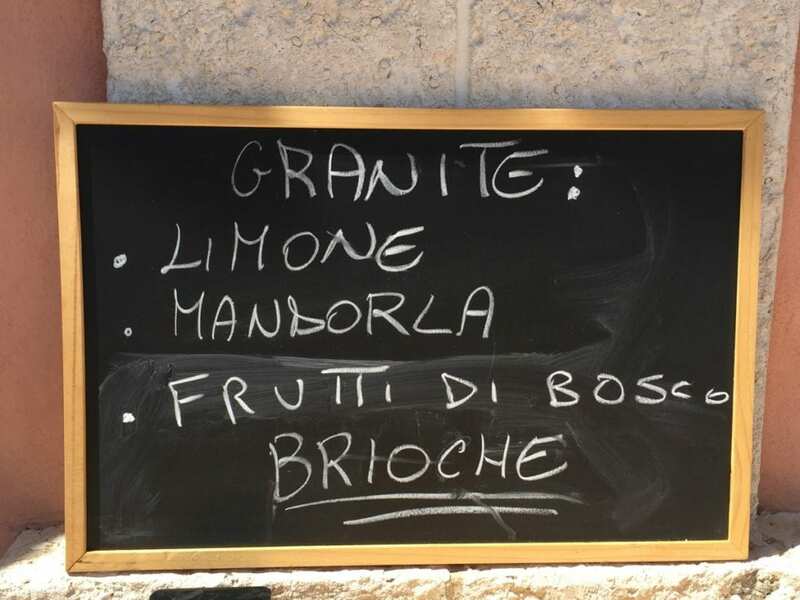 There was an older guy named Nicola that would drive by in his ape and my cousin Lucia and I would run downstairs to get the granita in the brioche for us and our siblings. Some days I would dribble on some of the amarene her mom canned (cherries in a delicious syrup)and that would be the most perfect breakfast ever! 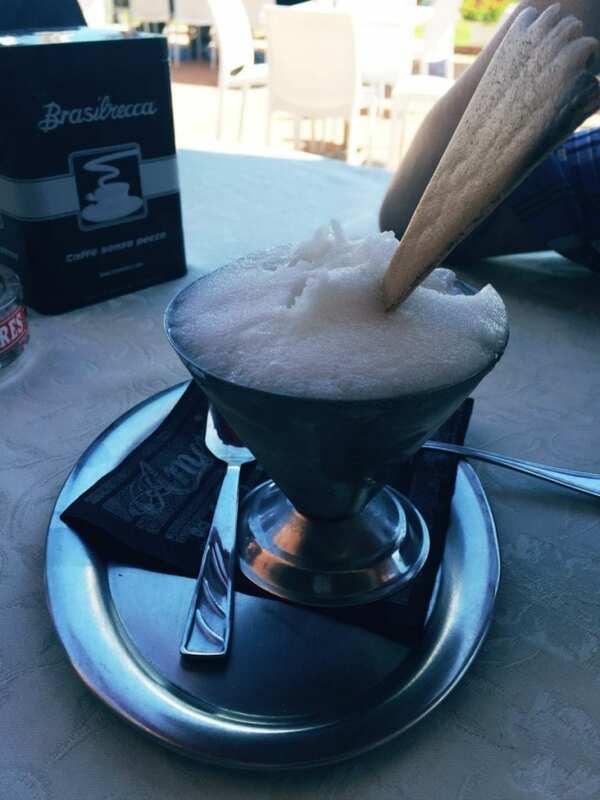 But this summer in Sicily after dealing with the heat walking around town and finding minimal air conditioning or no air conditioning anywhere, it’s nice to chill out with a refreshing cup of granita! I hope you enjoyed this little taste of Sicily and that it made you hungry! I will be back soon with some more photos and recipes! I’m still catching up on putting together the 1,000’s of photos from our trip!! Ciao and thanks for stopping by! !